17 3/4" circumference and 8 1/2" tall. 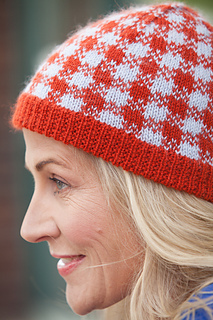 Angora grants its soft halo to the two-color Complements Hat, a plaid cap with doubled brim. Finished Size 17¾“ circumference and 8 1/2” tall. Yarn Classic Elite Yarns Fresco (60% wool, 30% baby alpaca, 10% angora; 164 yd [150 m]/1¾ oz 50 g): #5327 wake up red (MC) and #5304 sugar blue (CC), 1 hank each. Needles Size 3 (3.25 mm): 16” circular (cir). Size 5 (3.75 mm): 16” cir and set of double-pointed (dpn). Adjust needle size if necessary to obtain the correct gauge. Notions Markers (m); tapestry needle. Gauge 29 sts and 31 rnds = 4” in Plaid patt on larger needle.